This project is already way beyond it's goal, and ending in just a few days, but it was way too cool to not mention. It's a really well-designed time travel calendar showing important events throughout the history of fictional time travel, starting with Teenage Mutant Ninja Turtles: Turtles In Time at 2,500,000,000 BC. Check out the video below. This is the culmination of years of sci-fi fandom and design practice. I want to create a high quality calendar that will help everyone make their home or workspace approximately 45% nerdier and 100% better-looking (Ok, maybe not a 100%, but better-looking. Honest.). 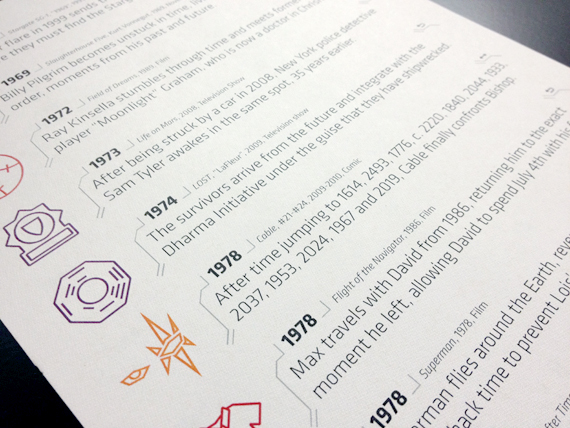 The calendar collects time travel events from films, comics, TV shows and videogames and puts them on a single timeline that plays out over the year. You're getting about 2.6 billion years of time travel in 12 months. The calendar itself will cost you a $25 pledge, and a $75 pledge will get you the calendar and many bonuses, including a silkscreen poster with all of the 97 icons. The icons are REALLY cool. So cool, that you can get a custom icon plus 4 calendars and much more for a $500 pledge. The goal was $9,340. This was passed a long time ago. But that doesn't mean you shouldn't pledge. Alex made a similar calendar last year and it sold out very quickly. Check out The 2012 Time Travel Calendar on Kickstarter! The Andrew 12-Sided Dice Clay webseries ended at 105% funded with $7,387 in pledges. The Ice Cream Cthulhu triptych ended at 227% funded with $14,800 in pledges.